Dream. Dress. Play. 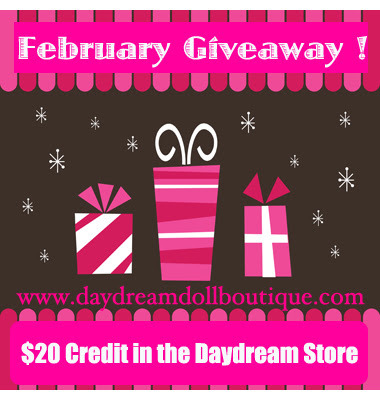 : February Giveaway ! So this month I decided to make things more interesting. I thought it would be fun to let you choose what you wanted from our store. I think you would be surprised how many goodies you can get for $20. So that's it. You pick what you want and I ship it to you. To enter just become a follower, or if you are one just leave a comment. Good luck everyone ! Submissions end Feb. 1 midnight, please contact us within three days of the close of the Giveaway to claim your prize or we have to draw another name. I follow with GFC (nicolthepickle). I love the little school days outfit. It's so cute. You have some amazing things in your shop, so cute! I'll tell all my friends to have a look. If I won I would spend the $20 on, the Hoodie Dress, Rainbow Leggings and the White Boots. And just pay the extra. Love your shop!!! Would enjoy shopping for some new stuff for my Julie doll. I just found you (and am following) and you are making my life much less expensive. I'm finding such cute things for my daughters new doll. Thank You! I love your blog. If I win my daughter will have fun choosing something cute for her AG doll. I'm a new follower! I would love to win this for my two sisters, they love AG doll clothes!! Love your clothes! Might have to make a purchase for my daughters birthday! I'm a follower--especially love the hoodie jacket and the everyday cutie outfit. I'm all about the cute PJ's! They are adorable! GFC Follower. Love the clothes! Cute giveaway! I now follow you via GFC! Great giveaway! I love the clothes you make. Winning this would make my dd so happy! I'm a follower. I would love to win this giveaway for my daughter. I remember when I got my first American Girl and now they have all the bells and whistles for them. I would choose the adorable tea party dress and a pair of the mary janes I think. I now follow your blog under Party of Five and can't wait to keep coming back! thanks! I'm sick of seeing naked baby dolls around our house. They could really use some clothes. I'm now following with GFC. Great giveaway, thanks. Just became a follower! woohoo!!!! I'm now a follower. Cute giveaway!! Totally would love this for my nieces and their dollbabies!! You're right, there are a bunch of things you can get for just $20! I love your shop! I'm a follower of your blog now. I think if I won I would use the gift certificate to get the poodle pjs and a robe or the black floral party dress. Both are super cute! Also I love that Kit is your new model! I have her too! Wow so many cute choices, I'm not really sure what I would pick if I was the winner. Thanks for the fun giveaway. I'm a follower - love the tea party dress! I am a follower. I think if I win I will have to let my daughter get on and see the outfits before I chose anything. You have a great shop - I will be back for my daughter's birthday thats for sure! I just started following your blog. What a fantastic giveaway! I'd love to win this for my daughter...she would have so much fun picking something(s) out for her dolls! Thanks for the opportunity! i myself am in love with the red coat ! I am a new follower. Love the red coat too! I Love your store! I would love to win and I think your store is amazing! It is the only place where you can find in-expensive doll clothes! I found you on the internet and loved it right away! I would love, love, love to win so please consider me! I am a follower and Oh my I need to stop by and do some shopping. I'm a new follower, your clothes are SO cute! I would love the Garden Party dress!! I'm a new follower. I would love to win this, my daughter's birthday is the end of Feb and I'd love to get a new outfit for her doll. I'm a follower. Great stuff! My daughter would love being able to get some new clothes for her doll. I'm a new GFC follower as frugal tumbleweed acres. follower! my daughters would have so much fun picking new dolly things! I am a new follower. Cute clothes!!! I am a new GFC follower! Love the clothes and the prices! Thanks, my daughter would love it! I'm a new follower. I have 3 daughters who love their dollies. You have the most adorable outfits! I just found out about your site and became a follower. I'm so excited to have found your doll clothes and accessories. Thanks! I am a new follower and love the Tutu Cute Oufit and think my DD will too. New follower on gfc. Totally love the beautiful clothing & accessories. My dd will love this site too! I just found you through Happily Domestic. Great clothes for dolls - very cute! I love all the everyday outfits, especially the pink stripe dress - it totally reminds me of my daughter. I now follow you, and am crossing my fingers to win! I follow! Thanks Happily Domestic for pointing you out!!! I love your shop!!! New follower, LOVE your site! Such cute clothes! I an also a newbie follower, your items are fantaztical. i got so excited i signed up twice as a follower, oopsie, doe's that make me a double fan? My March Giveaway-Tell me what You Think ? All About The Red !